Kansas State came close to upsetting Auburn at home earlier this season, but made to many mistakes and lost. That didn’t happen against Oklahoma, as the Wildcats beat the Sooners at their place 31-30. The deciding factor in this game, was a blocked field goal in the fourth quarter. I thought that Oklahoma would take advantage of their home field advantage and win a close one and I was wrong again. The game was close, for all four quarters, with the biggest lead being by seven points. The Big 12 is starting to set itself apart, as the second best conference in college football. I know I’ve said numerous times that the Pac-12 was the second best conference, but no other conference outside of the SEC has this many great games. Kansas State quarterback Jake Waters had a great game and was almost flawless. Waters completed 15 of his 23 attempts for 225 yards and two touchdowns. Waters also finished with 51 yards rushing and a touchdown, his 53 yard run is what I think won them the game. Waters is a great leader and starting to make a name for himself and he might be a dark horse for the Heisman. Senior receiver Tyler Lockett caught six passes for 86 yards and a touchdown. Senior running back DeMarcus Robinson rushed for 66 yards on eight carries, that included a highlight reel 38 yard run. Oklahoma quarterback Trevor Knight finished with a big game, despite the lose, he completed 26 of his 32 attempts for 318 yards and three touchdowns. Samaje Perine got back scored a touchdown for the fourth straight game and rushed for 89 yards on 24 carries. Perine is just a freshman and has a bright future ahead of him and at 243 pounds, he has NFL scouts drooling. Sterling Shepard continued his great junior season, with 197 yards on 15 receptions and a touchdown. Shepard was the player of the game in my opinion, he just put on a flat out show. The Sooners finished with 533 yards of total offense and I’m still trying to figure out how the lost this game. Knight and Durron Neal both threw an interception and Oklahoma kicker Michael Hunnicutt missed two field goals, one from just 19 yards and the other from 32 yards. 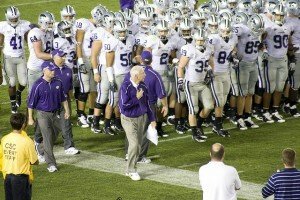 Kansas State coach Bill Snyder preaches to his team that you won’t win if you make mistakes and the Wildcats didn’t make mistakes today. They didn’t turn the ball over or miss field goals and they only had two penalties the whole game. They’re the least penalized team in football. Oklahoma got on the board first, late in the first quarter, on a two yard run from Perine. Kansas State retaliated less than a minute later with a touchdown of their own, on a 62 yard pass from Waters to Glenn Gronkowski. The Wildcats would then score on a pick six by Danzel McDaniel on an awful throw by Knight. Two plays later the Sooners would score on a 47 yard pass from Knight to Shepard. It was a back and fourth game and it was really fun to watch. The score at the half was 21-17 Kansas State. The Wildcats would score on a 27 yard field goal by Matthew McCrane to kick off the third quarter, to take a seven point lead. Converted tight end Blake Bell would be on the receiving end of Oklahoma next touchdown to tie up the game. Kansas State went down the field on five plays, to score and take a seven point lead yet again. The next drive would decide the game, with over ten minutes left in the game, Knight completed a nine yard touchdown pass to Neal. But, unfortunately for Oklahoma the extra point go blocked and they were unable to score the rest of the game. Kansas State will host Texas next week. Texas is struggling this season and with Kansas State controlling their destiny in the Big 12, they can’t afford a let down or to overlook the Longhorns. Oklahoma has a bye week next week, but the following week they travel to play at Iowa State. The Sooners need to take care of business against Iowa State and then get ready to host Baylor for a chance to redeem themselves.